Texture is the important point for Udon noodle. Enjoy the flavor of domestic wheat and chewy texture. 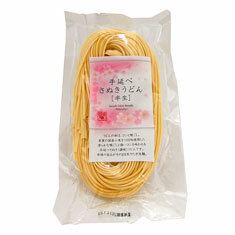 It is made of simple ingredients; domestic wheat, sea salt, and sesame oil. This is produced in a traditional way succeeded from the past. The domestic wheat has specific good taste and that matches not only taste of Japanese traditional noodle, but also traditional fermented food such as soy sauce, miso, and soup from bonito, dried kelp, and dried shiitake mushroom. Eat with soup or dip into strong soup. Make your own soup and enjoy this Udon. Cut Udon-noodle in about 30cm each. Put it in about 2 liter of boiled water in a big pan, and cook it for about 10 minutes while stirring it with chopsticks. Take the noodle up as soon as it has done cooking, wash it by rubbing with running water. *Be careful of as hot water spill over while boiling noodle. *Be careful of getting burn from hot water or noodle.